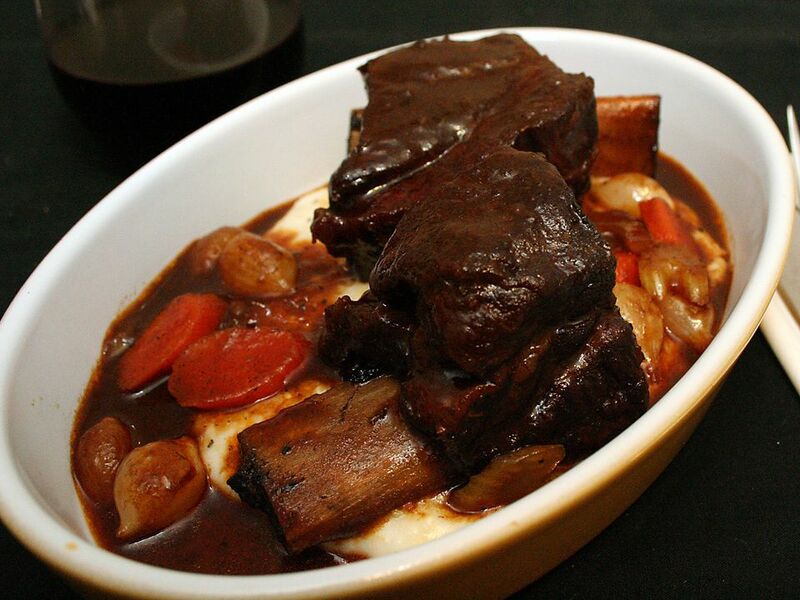 Braised short ribs are a great cut if you want a small amount of beef, so they're a perfect choice for two. They're incredibly flavorful and become "fall-apart" tender when slow-cooked. The method of adding and discarding the initial batch of vegetables results in a delicious, complex sauce, while the vegetables added at the end of cooking remain flavorful and tender but not mushy. Salt the short ribs liberally on all sides. Coat the bottom of a medium-sized oven-proof dutch oven with oil and heat over medium-high heat. When the oil shimmers, add the ribs in a single layer without crowding. Brown on all sides (as best you can). Remove and set aside. Add the onion and diced carrot (reserve the other carrot) to the pan and cook, stirring, until the onion pieces separate and the vegetables begin to soften. Add the garlic and cook for another minute. Stir in the tomato paste and cook for a few minutes, until the paste begins to brown slightly. Add the wine and stir, scraping the bottom of the pan to dissolve the browned fond. Bring to a boil and cook for a minute or so, then add the beef stock and bay leaf. Add the ribs; the meat should be mostly but not completely submerged. If the liquid level doesn't come about two-thirds of the way up the ribs, add more beef stock. Cover the dutch oven and place in the oven. Cook for about 90 minutes, or until the meat is tender and is pulling away from the bones (depending on the size of the ribs and your oven, this can take longer. Be patient.) If some or all of the meat falls off the bones completely, don't worry. When the ribs are is done, remove from the sauce and keep them warm in a warming drawer or low oven. Strain the sauce mixture through a coarse strainer into a fat separator and discard the solids. When the fat has separated, pour the sauce back into the pan. If you don't have a fat separator, remove the meat, strain the sauce and let it sauce cool until any fat has risen to the top. Remove as much fat as possible with a spoon or use paper towels to blot it off, then return the sauce to the pan. Note: If you like, you can make the dish to this point and refrigerate overnight before finishing. Don't worry about removing the fat from the sauce; just refrigerate the sauce and meat separately and remove the layer of fat from the sauce before continuing. About 5 minutes before serving, add the ribs and mushrooms to the sauce to heat through. Serve over mashed potatoes, grits or noodles.